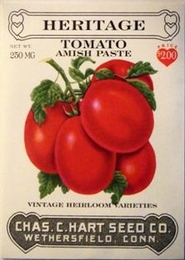 From the Amish comes this family heirloom tomato discovered in Wisconsin. Plum shaped red fruit, 1/2 pound size. Medium indeterminate plant with wispy regular shaped leaves. Fruits have sweet taste with somewhat juicy flesh, popular for whole canning, paste and puree. Plant seed indoors 6-8 weeks before danger of frost is past. May also be planted outdoors after last frost. Plant seed 1 inch apart and cover with 1/4 inch of fine soil, well pressed down. Place seed starting tray in a very warm place (both day and night) and cover with plastic to preserve moisture until seeds sprout.